The fast changing reality in technical and natural domains perceived by always more accurate observations has drawn the attention on a new and very broad class of systems mainly characterized by specific behavior which has been entered under the common wording ”complexity”. Based on elementary system graph representation with components as nodes and interactions as vertices, it is shown that systems belong to only three states : simple, complicated, and complex, the main properties of which are discussed. The first two states have been studied at length over past centuries, and the last one finds its origin in the elementary fact that when system performance is pushed up, there exists a threshold above which interaction between components overtake outside interaction. At the same time, system self-organizes and filters corresponding outer action, making it more robust to outer effect, with emergence of a new behavior which was not predictable from only components study. Examples in Physics and Biology are given, and three main classes of ”complexity” behavior are distinguished corresponding to different levels of difficulty to handle the problem of their dynamics. The great interest of using complex state properties in man-made systems is stressed and important issues are discussed. They mainly concentrate on the difficult balance to be established between the relative system isolation when becoming complex and the delegation of corresponding new capability from (outside) operator. This implies giving the system some ”intelligence” in an adequate frame between the new augmented system state and supervising operator, with consequences on the canonical system triplet effector-sensorcontroller which has to be reorganized in this new setting. 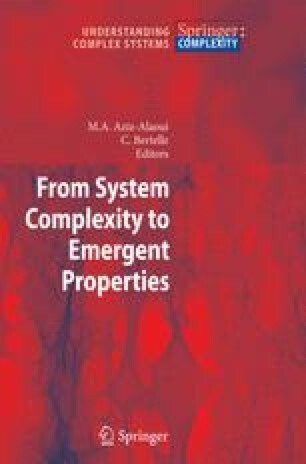 Moreover, it is observed that entering complexity state opens the possibility for the function to feedback onto the structure, ie to mimic at technical level the invention of Nature over Her very long history.